Is it possible that when we look into the cosmos that we are seeing into the past? Hubble Deep Field showing galaxies up to 10 billion light-years distant from Earth. We hear all the time that we are looking into the past when we look out into space. But we can’t definitively say that! In the following I’ll explain why. Astronomers say that because the speed of light is a finite value (c = 299,792.458 km/s ) it takes light 1 year to travel a distance of 1 light-year. On the surface of it that seems very reasonable. That means that light leaving the star alpha Centauri, which is 4.3 light-years away, took 4.3 years to get to Earth and thus the information in that light is 4.3 years old by the time it gets to Earth. Thus they say we are looking back in time — into the past. And for distant galaxies this means we are looking back in time even billions of years. Published in Creation magazine 37(2):22-24, 2015. Over years of researching cosmology and astrophysics, I have argued that ‘dark matter’ is a sort of ‘god of the gaps’,1 the ‘unknown god’. It is proposed mainly to rescue the standard big bang model from problems when a mismatch is found between the theory and some observations. However, secular cosmogonists (scientists who study the beginning of the universe) usually believe the big bang worldview to be correct as well as all its associated astrophysics. So they must postulate something invisible to explain the discrepancy. This ‘something’ is ‘dark matter’, a hypothetical substance that emits no light or radiation, so cannot be seen. Modern astronomy describes a universe that is billions of light-years in extent. If we reasonably assume that a light-year is the distance that light travels in one year at one light-year per year and that the speed of light has been a constant over all time since the creation of the Universe then creationists have a problem, don’t they? Since the Universe was created only a mere 6 thousand years ago how can light travel billions of light-years? This is called a light-travel-time problem. Despite increasingly compelling arguments from biblical creationists that offer solutions to this problem, still many doubt the Bible’s clear timescale. This is because, they think, it is impossible for light to have reached Earth in only a few thousand years from galaxies that are billions of light-years away. This misconception is often the ultimate stumbling block to a straightforward acceptance of the Bible—even the gospel itself. 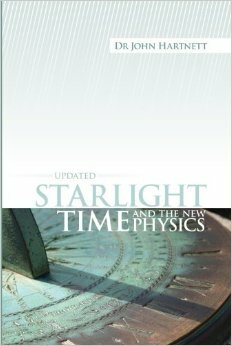 This book, Starlight, Time, and the New Physics, provides one such solution and it is summarized below. But before proceeding know this, the most accepted model describing the origin of the universe in the hot big bang also has a light-travel-time problem. This is called the horizon problem. See my blog, Big bang has a light-travel-time problem.